So I know the theme this month is Sewing for Home, but 1) I’m out of long neglected home sewing projects and 2) we were doing some holiday baking so 3) my kids needed aprons which 4) you don’t wear out of the house. So I’m calling how to sew an apron close enough to sewing for home – these are kitchen accessories, right? Right. So, here’s a super easy way to make them. Like super duper make in one episode of Gilmore Girls easy. 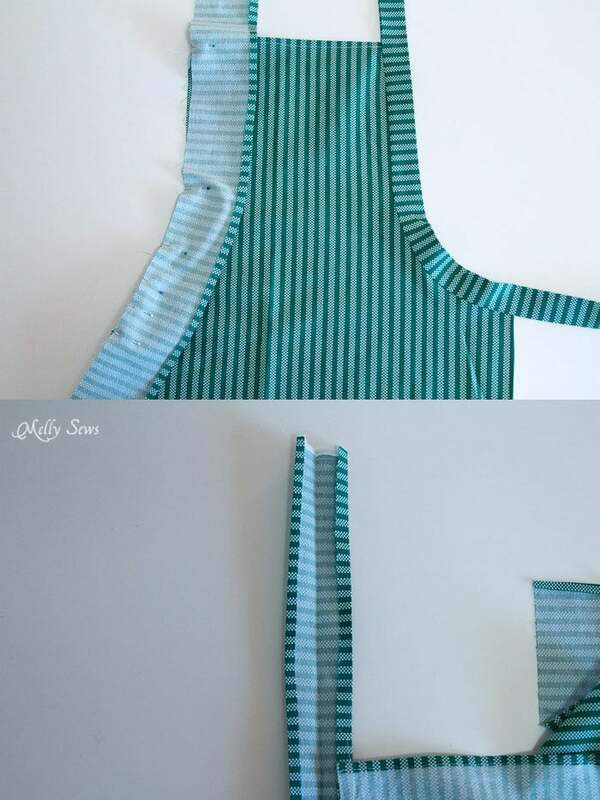 You’ll need about 1 yard of fabric to make a child sized apron. You’ll also need their chest, waist, neck to waist and waist to knee measurements. 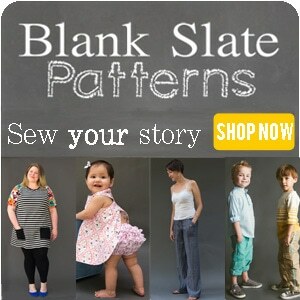 If you don’t have those handy (or don’t want to deal with getting them from a wiggly kid) you can also use the chart below to start with; since aprons don’t have to be precisely fitted, basing yours off the chart below isn’t a big deal even if your child is outside the norms for their size. Draft your pattern as shown in the diagram above. 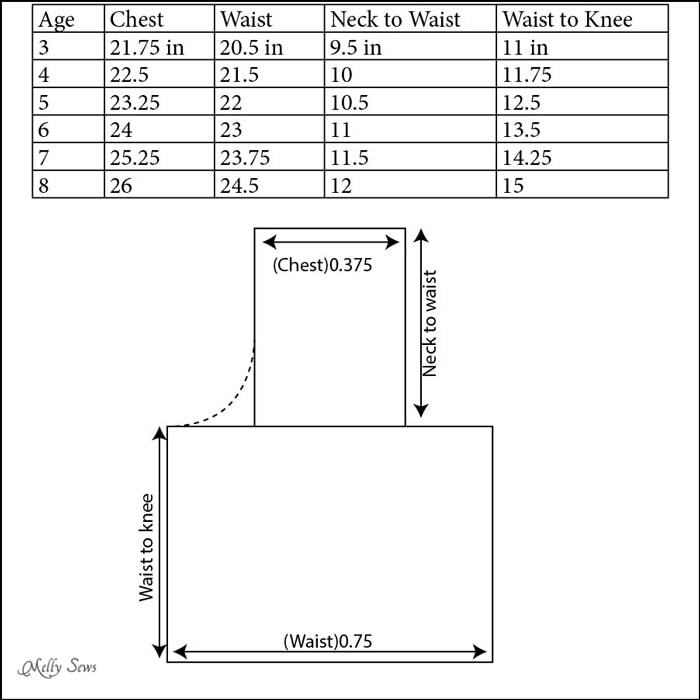 First draw a rectangle that is 0.375 times the chest measurement wide by the neck to waist measurement tall. Then draw a rectangle centered below your first one that is 0.75 times the waist measurement wide by the waist the knee measurement tall. Finally, draw a curve to connect the two boxes, as shown on the left side of the picture. Repeat this curve on the right side. 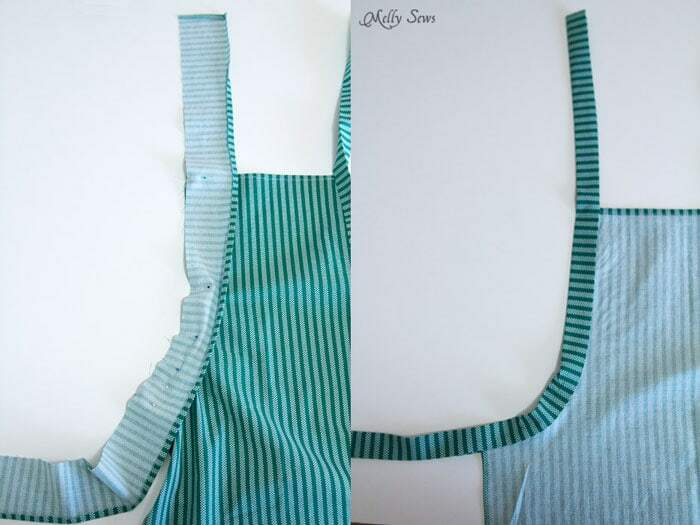 In addition to the apron itself, you’ll need 2 strips of fabric that are 2-3 inches wide (I used 3 in pieces) and the length of the curved side of the apron plus at least 18 inches for the ties. For my apron (which is a size 6) I just used strips that went from selvedge to selvedge, so they were 44 inches long. Note: you could also use extra wide double fold bias tape. Start by pressing all the straight edges 1/4″ to the wrong side twice to form hems (do the two sides first and the bottom last). Stitch. Press the short ends of the ties 1/4″ to the wrong side and press one long edge 1/4″ to the wrong side. 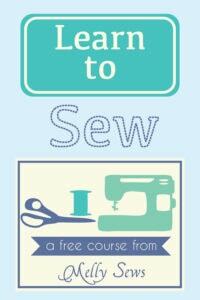 Pin the unpressed long edge of each tie along the curved edges of the apron and stitch. 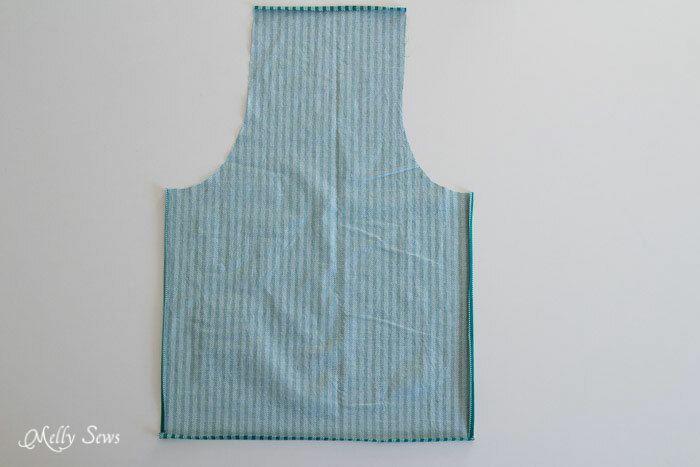 You want about 8″ of the tie to extend above the top of the apron, and 10″ to extend beyond the side. 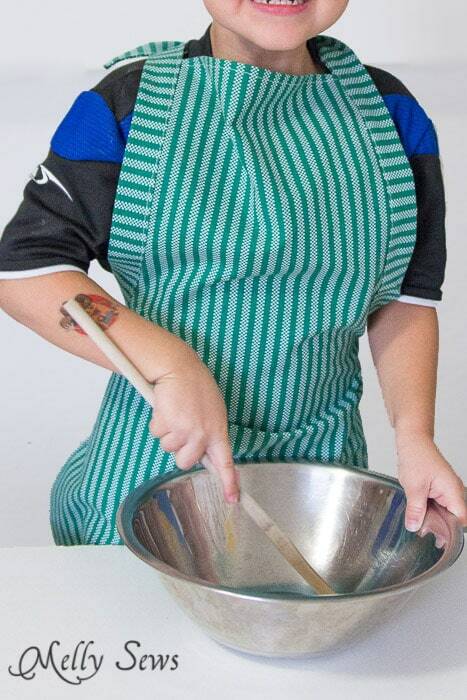 These will be the ends you tie together to put the apron on. Press the seam toward the tie, and press the raw (unfolded) edges of the ties to the wrong side the same amount as your seam allowance. Fold the tie in half, lining up the pressed edges and covering the seam. Stitch again, stitching across the short ends as well, to enclose all raw edges. 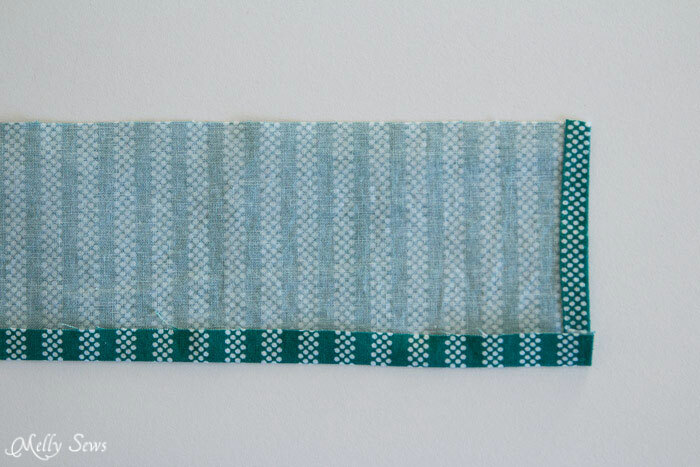 Note: Since I didn’t cut these strips on the bias, they don’t lay perfectly flat along the curve. I knew this would happen, but for a kid’s apron it’s acceptable to me. To avoid this, you need to use bias cut strips and steam them into shape like I did in this post. And voila! One kid’s apron done. 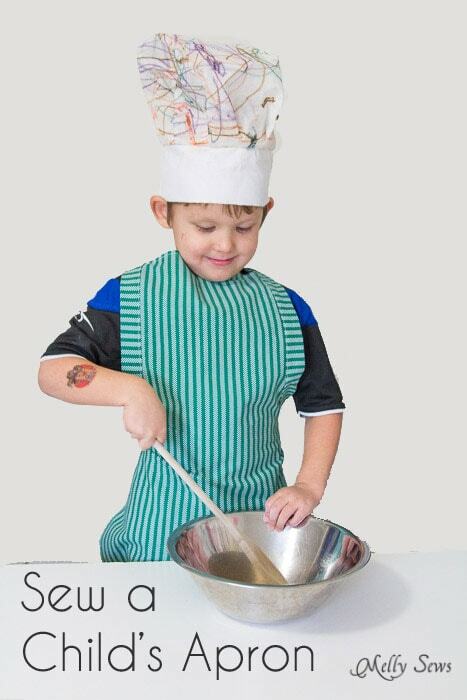 Want to make a personalized chef’s hat too? See this post.